Mark Douglas is having a bad day. He's trying to get some photos of whales that might be getting ready to beach themselves but he's unable to get a good shot. Mark is a freelance photographer who's hoping to sell his photos to the Edinburgh Evening Standard. Then his phone rings and he's informed his wife hasn't picked up their son Nathan from school. Assuming that Lauren has been delayed somewhere along the way, Mark picks up Nathan and begins trying to track Lauren down. 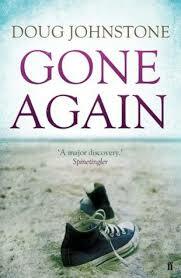 So begins Gone Again, a novel about a man's search for his missing wife by author Doug Johnstone. At first, the police are reluctant to believe that there is anything to investigate. Lauren is an adult, and if she needs a few days on her own, there's nothing criminal in that. Mark begins to look more interesting to them after a few days when Lauren still hasn't returned, and it turns out that Mark has a history of violence -- he's had a restraining order taken out against him by none other than Lauren's mother. At the same time, Lauren herself has a bit of history. Soon after Nathan was born 6 years ago, she disappeared for 10 days while suffering from terrible post-natal depression. She seems to have recovered and settled into motherhood and her job at a local estate agency, but recently she's found out that she's expecting another baby. Has the thought of another round of depression caused her to take off again? Since the police aren't too keen to get involved, Mark starts his own investigation. He begins at Lauren's office, where her boss Gavin Taylor assures him that Lauren seemed fine the day she disappeared, even though she took a half day off work. Mark has an uneasy feeling about Gavin and thinks he knows more about what happened to Lauren than he's letting on. When someone breaks in to his home and steals Lauren's laptop, Mark really begins to wonder if she was involved in something she shouldn't have been. I enjoyed reading about Mark's growing desperation as he attempts to track down Lauren while trying to keep things as normal as possible for their son Nathan. His anger at the police eventually causes him to team up with Lauren's mother in an effort to locate the missing woman, something he never expected that he would do. The story builds to a very exciting conclusion as Mark finally finds out what caused Lauren to disappear, and why some people are willing to go to extreme lengths to keep him from knowing the truth.